A few colourful additions to the First fleet in Norwich have appeared over the last couple of weeks and Mark Doggett has been out and about to capture them in use in the city. 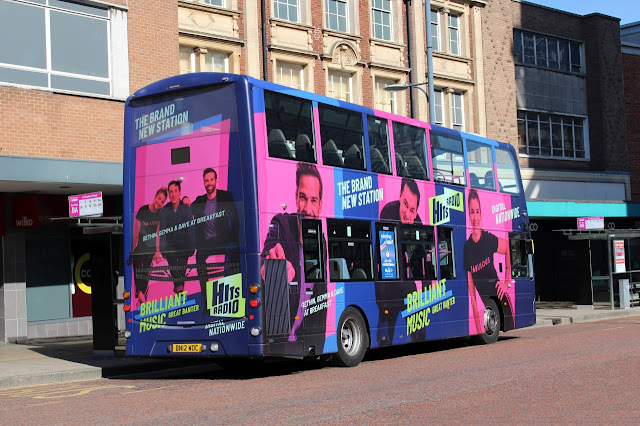 First up is Volvo B9TL 36202 BN12WOC which has gained a full wrap advert for Hits Radio, two views of her in and around St. Stephens. Next is former Essex Volvo B7RLE 66822 MX05CEO which has gained the Advert livery for the companies contactless payment system similar to Dart 42938 at Lowestoft. Its pictured below in Tombland working the 38 Service to Long Stratton. 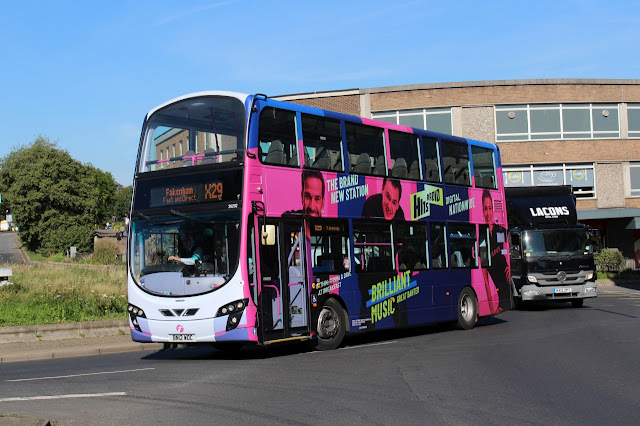 Finally the second of the two recent arrivals from Essex 66824 MX05CEV has gained the new generic lilac front for use on all City routes and is seen below in Castle Meadow. Many Thanks to Mark for his superb photos. A couple of changes to services on the periphery of our area are included in today's Notices and Proceedings Report, published by the East of England Traffic Commissioner. Coastal Red, trading as Lynx, is to amend the timetables of two of its routes serving Wells Next The Sea. 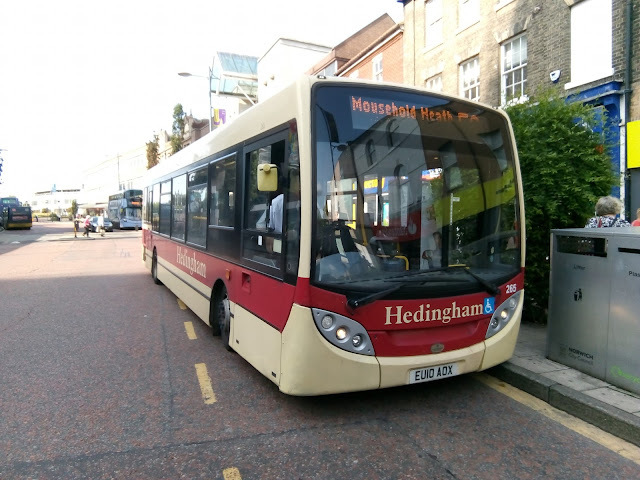 They are the 36 to Fakenham Oak Street and the 37 to Hunstanton with changes to take effect from 28th October 2018. 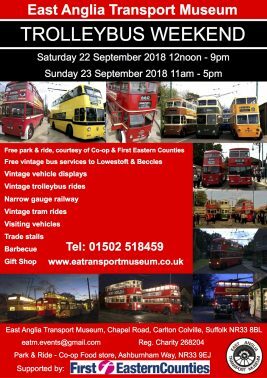 Just a brief reminder that Showbus 2018 is being held at Donington Park this coming Sunday 30th September and, again, I will be unable to get there as I have yet another commitment! 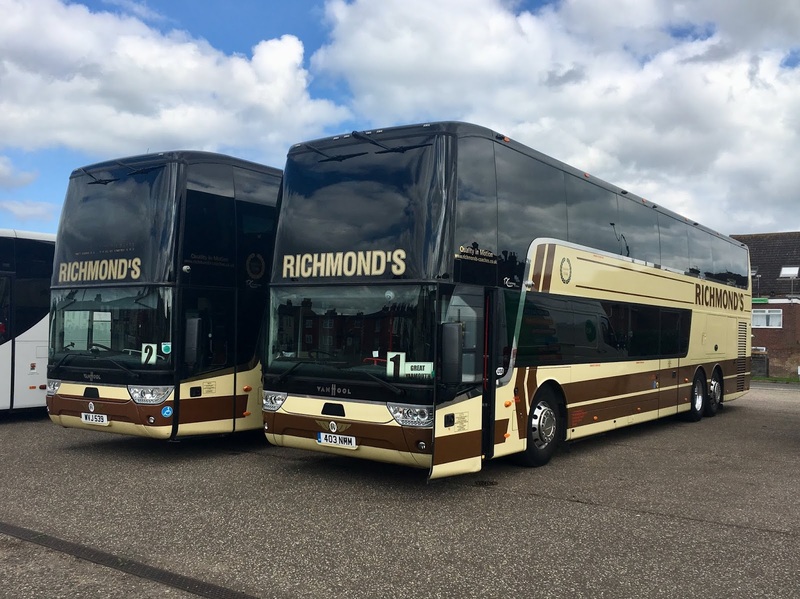 Two former Lochs and Glens Touring Coaches have been aquired by Sanders recently and have already been noted at their depot in Holt. One of the new arrivals noted in the parking area at Holt. 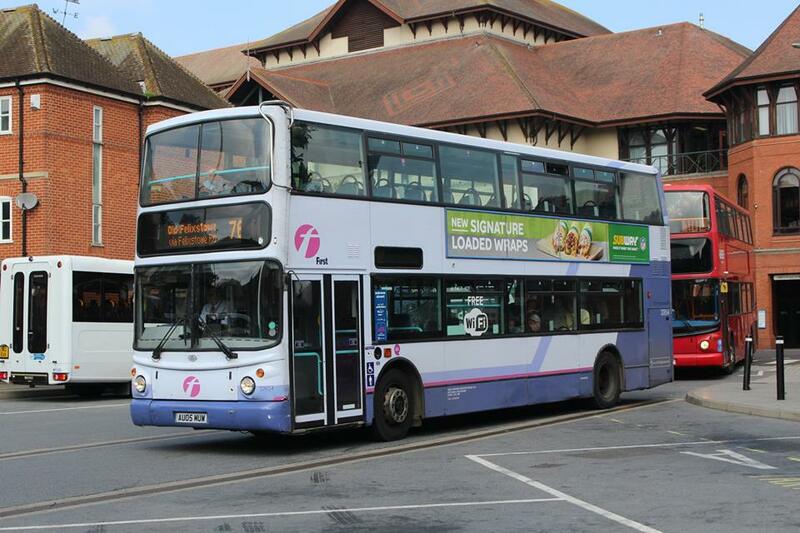 Both are Jonckheere bodied Volvo B13R's, BT14DLX & BT14DLZ. These have replaced two 12 plated Coaches that have recently been sold. Thanks to Nick and Josh on Twitter for the heads up! You will no doubt remember that I reported on 10th September 2018 that BorderBus had been loaned former Metrobus Scania YN53RYB (see BorderBus Loan & Lamberts Update). Simon Bartram has supplied a photo of it in use on 15:25 Sir John Leman High School SJL3 working back to Carlton Colville during yesterday afternoon. Regularly at this time of the year, the East Anglia Transport Museum holds its end of season Trolleybus Weekend. This year's event will see all available vehicles from the fleet in use and, as the nights begin to draw in, there will be running after dark on the Saturday. There will also be the BBQ in the park plus trade stands along with static exhibitions and visiting vehicles. This promises to be a busy weekend for vehicle enthusiasts and families alike. Opening times are 12 noon to 9pm on Saturday and 11am to 5pm on Sunday. Little of relevance in today's Notices and Proceedings Report, published by the East of England Traffic Commissioner. 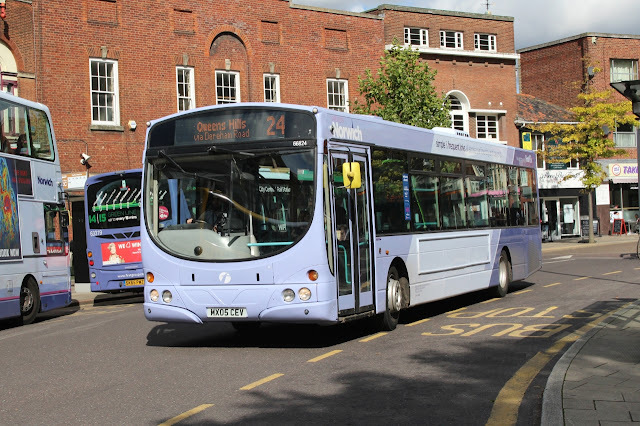 Interestingly the PVR (peak vehicle requirement) at Norwich) is increasing to 107 plus Excel buses. 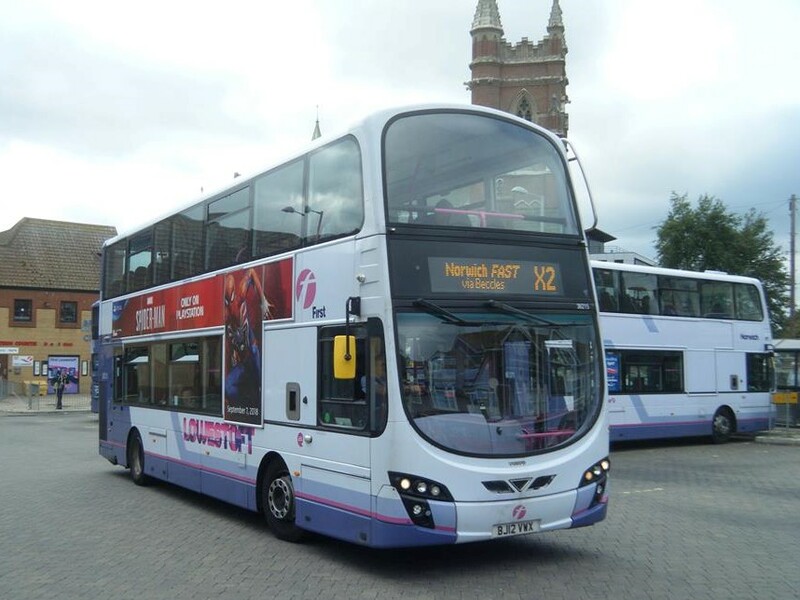 This is the highest it has been since September 2012 when Network Norwich was launched with just 98 buses, reduced from 105. Loadings in certain situations mean Norwich requires bigger buses - 62 seat ex London Volvo’s and Trident’s will not cope on certain journeys. 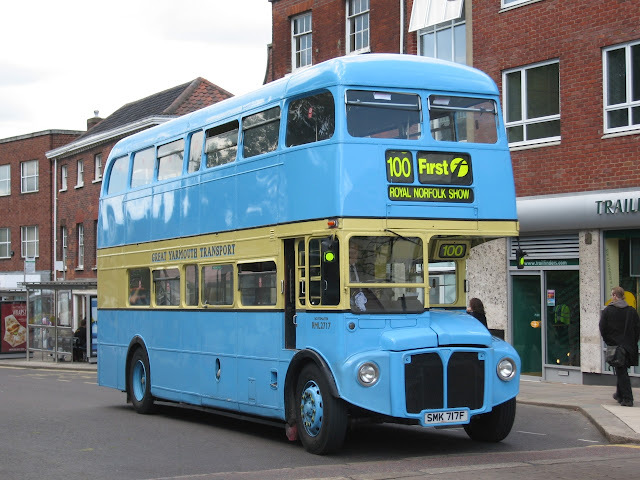 The 1630 X29 Norwich to Fakenham is a case in point where the colour of the bus appears less important than the number of seats - yellow, purple, blue and red have been seen in the last month alone! You may remember our post of 24th April 2018 (see New Norwich Trainer) concerning the then location of the three former First South West Dennis Tridents which had moved to the Great Yarmouth area on loan over the Christmas period. An early morning visit to Great Yarmouth today yielded a few surprises at Beach Coach Station and along Marine Parade. The other group comprised Amport & District's Van Hool TX16 Alicron bodied Scania K360EB4, in the form of WA15BWC, keeping company with P & O Lloyds BG64UZV - yet another Tourismo!! 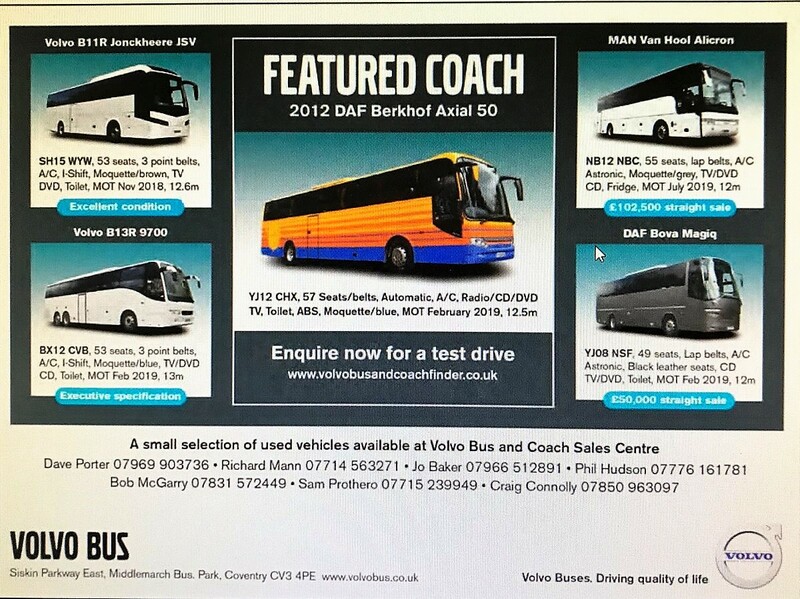 Two Berkhof Axial bodied VDL SB4000s have recently left the Sanders Coaches fleet. YJ12CHK performed its last duty with Sanders being used as a support coach for the East Coast Truckers Convoy in late August prior to its sale to an unknown buyer, The other coach is almost identical YJ12CHX which was noted for sale in an advert by Volvo Bus in today's Route One publication. 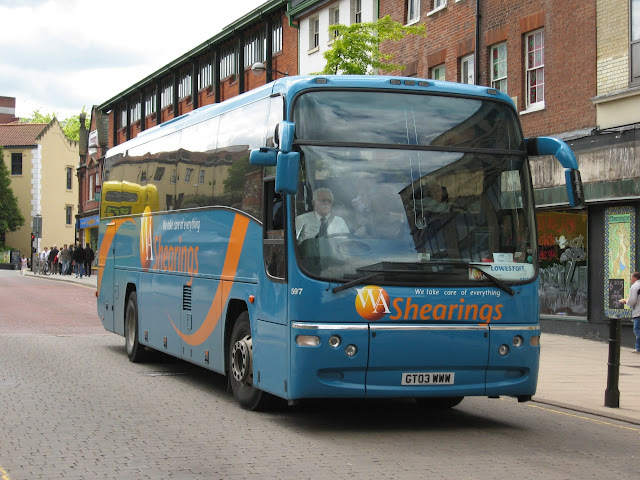 As many of you will know, Dereham based Freestones Coaches operates many coaches under the megabus branding. Irizar i6 bodied Scania ME54BUS was formerly YT62JBX and has recently received a repaint and its new registration. 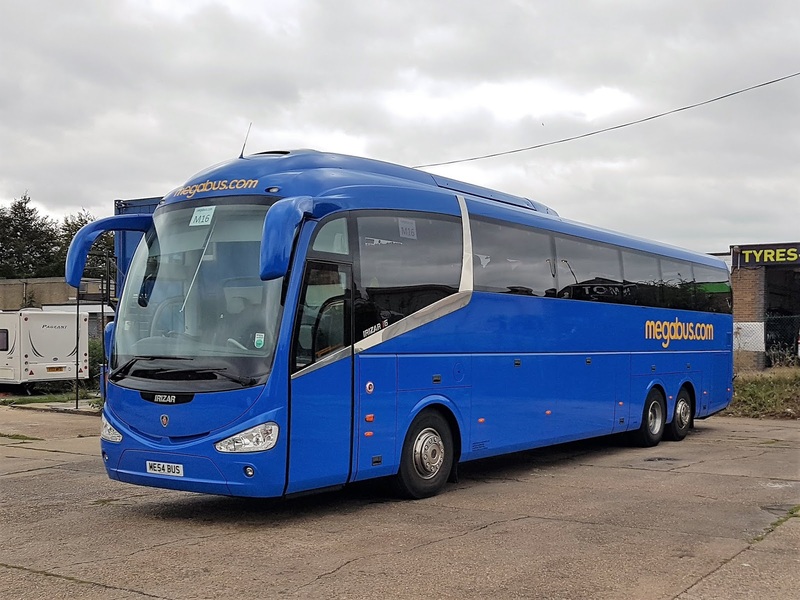 There is also news of another vehicle shortly to receive the megabus treatment and more details of that when they become available. My thanks to Tom Baker for the information and photo. Just one entry of relevance in today's Notices and Proceedings Report, published by the East of England Traffic Commissioner. It concerns the approval of a new operating centre for Micheal and Anita Babbs at Beach Station, Walton Avenue in Felixstowe. It has been authorised for nine vehicles and replaces the previous Ipswich Finance Centre site on the same road. 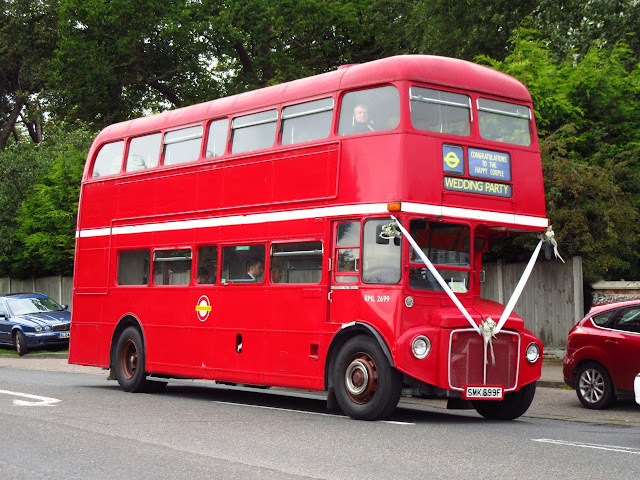 'Reg Vardy' was passing the BorderBus premises in Beccles earlier this morning and observed an interloper on site. 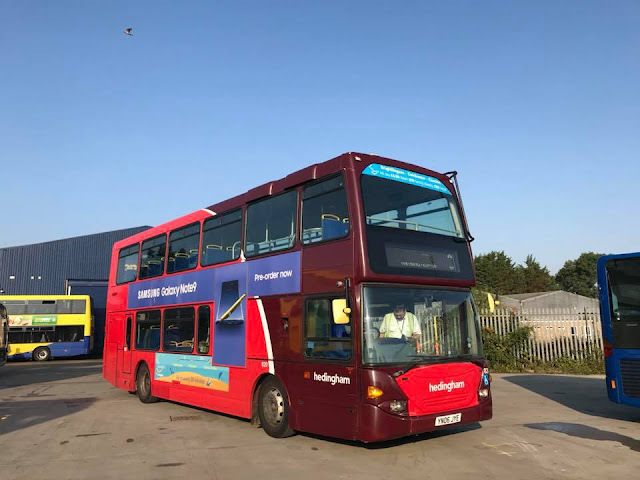 Apparently an Ensignbus decker has been loaned to the Suffolk operator in the shape of former Metrobus Scania YN53RYB. 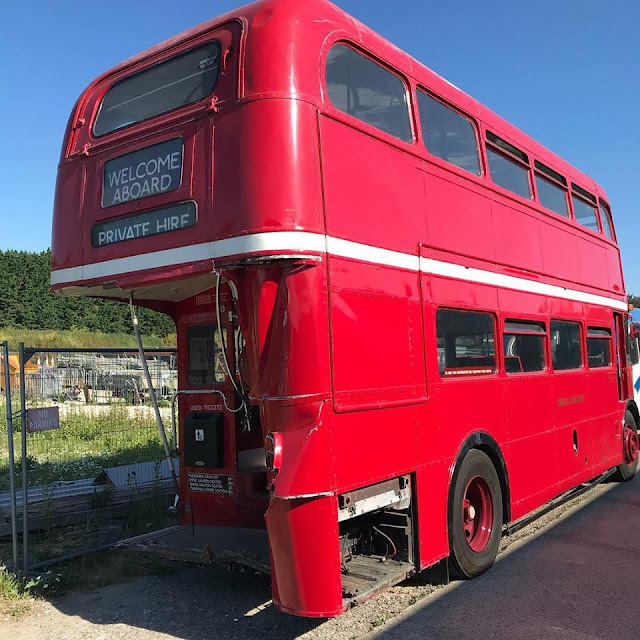 The East Lancs bodied Omnidekka had previously arrived at Ensign's Purfleet premises during May this year. Whilst at Moor Business Park he also visited the Lamberts Coaches site and it appears that the number in the fleet has been reduced. I previously posted that 'Reg' had suggested that some vehicles had been acquired by Beestons. I have subsequently been informed that although four were taken away by the Beestons' wrecker they were delivered to an Ipswich scrapyard. Note the presence of the Mercedes-Benz Vario which has taken up the mark of A18LKR and came from an operator in the Penrith area. 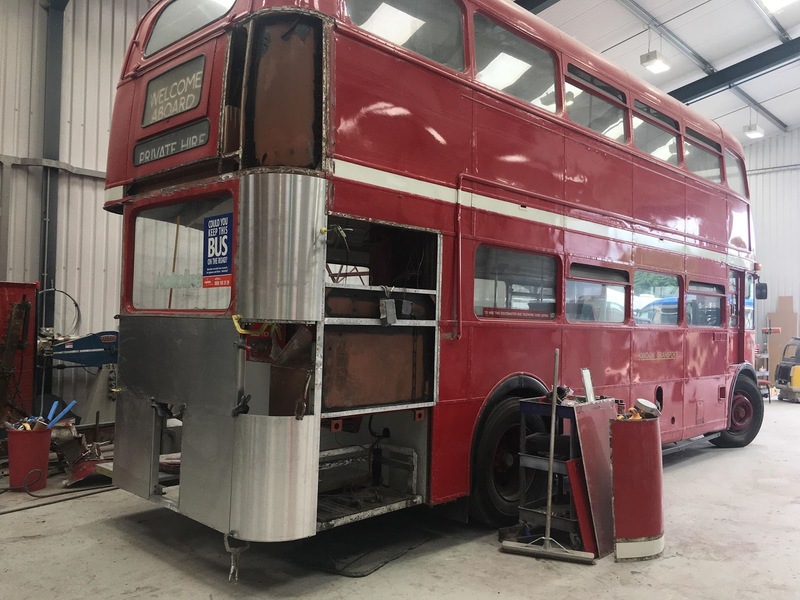 My thanks to 'Reg' for the pictures and to my contact at Lamberts Coaches for the updated information. 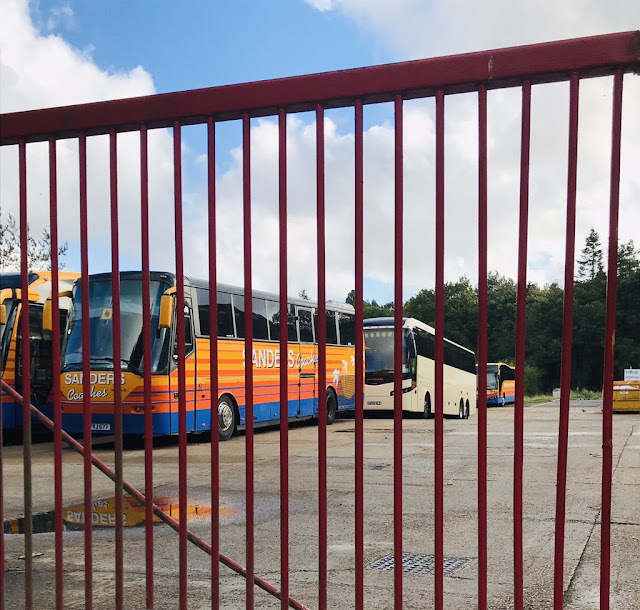 Two double deck coaches were among the sextet appearing at Great Yarmouth's Beach Coach Station earlier today. 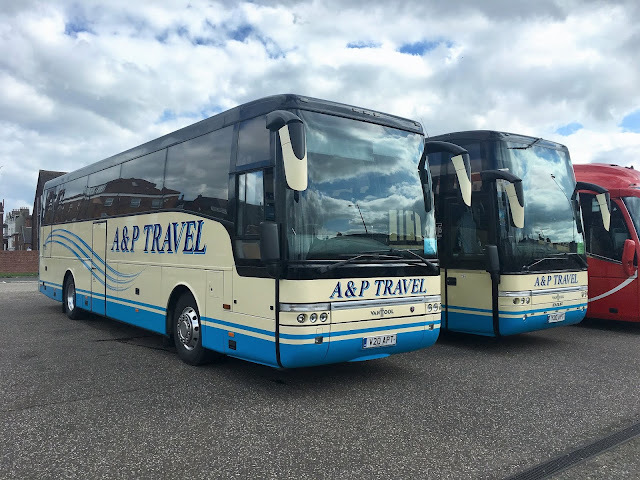 A couple of coaches from A&P Travel were also present in the form of V20APT and Y20APT. The former is a 1999 Van Hool bodied Scania K124IB4 whilst the latter is a Van Hool T916 Astron. V20 was formerly registered V729EDX and V40DGE when with Lodge of High Easter whilst Y20 was new to Galloway of Mendlesham as AY06CPX. The remaining coaches included Solus Coaches' Scania K360iB4 / Irizar i6 YN18SGY, on hire to KM Travel of Barnsley, and National Holidays' Setra NH11DTH. A few updates to report from Eastern Counties. 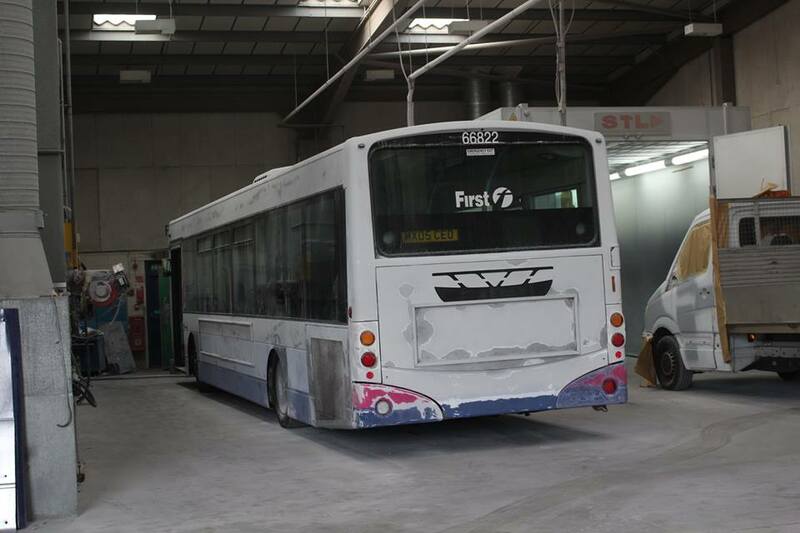 Firstly is the repaint of former First Essex Volvo B7RLE 66824 MX05CEV which transferred a couple of weeks ago. 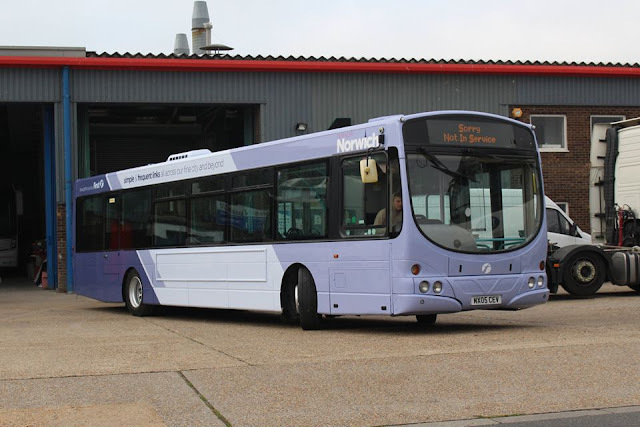 It has been given the new lilac fonted livery for all routes in Norwich. 66824 pictured at Simon Morris in Ipswich. 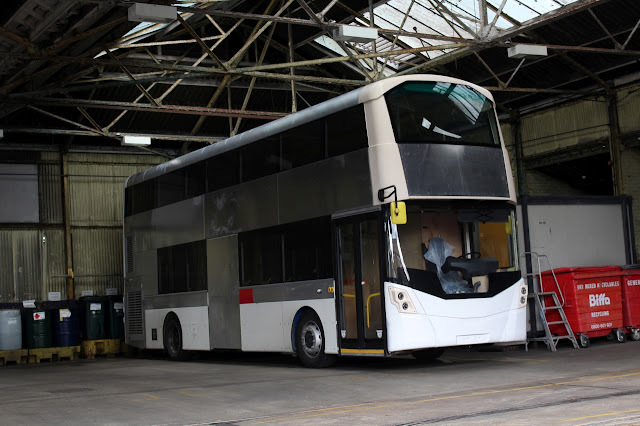 The second B7RLE 66822 MX05CEO is also at Simon Morris currently awaiting repaint, it is pictured below rubbed down awaiting the paint shop. Two Volvo B7TL/ALX400's have transferred back to Eastern Counties from Essex in the shape of 32652 AU05MUP & 32654 AU05MUW. Both were new to FEC in 2005 and allocated to Norwich before moving to Lowestoft then down to Essex. 32654 AU05MUW enters the Old Buttermarket Bus Station in Ipswich. Another Volvo B9TL from First Leeds is due to arrive in the shape of 36215 BJ12VWX. It is expected to be allocated to Great Yarmouth. Finally, Volvo B7TL 32214 LT52WTX has gone to Simon Morris from Norwich for repaint. Many Thanks to Mark Doggett for use of his excellent photographs. A couple of workings of note during this afternoon's visit to Gorleston High Street for supplies. I initially observed First Wright Eclipse Gemini bodied Volvo B9TL 37573 AU58ECX in the High Street, not on its branded Excel route. It was instead employed on the 14:30 service 8 from the James Paget Hospital to Caister Second Avenue. 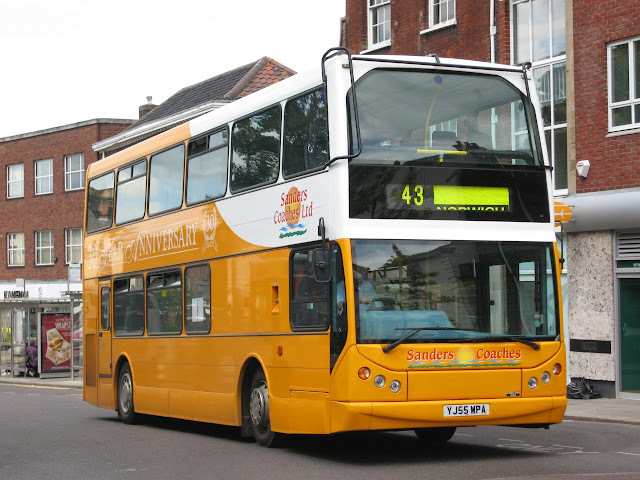 The second photo shows the delayed Border Bus 14:16 Bungay to Great Yarmouth Market Gates service on Church Lane in Gorleston. The operator's sole remaining Wright Eclipse Gemini LF52ZPB was operating the service and was noted wearing fleet number 200. 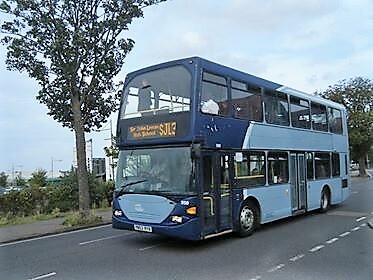 Finally, still on loan at Lowestoft, First Gemini 36271 BG12YKD was seen returning to the Suffolk town with the 13:54 ex Martham. Today's Notices and Proceedings Report, published by the East of England Traffic Commissioner, contains some entries of local interest. Ourhire, trading as Ourbus is to amend the route and timetable of its Acle Area Flexibus 71a/ 72a/ 73a services from 6th September 2018. 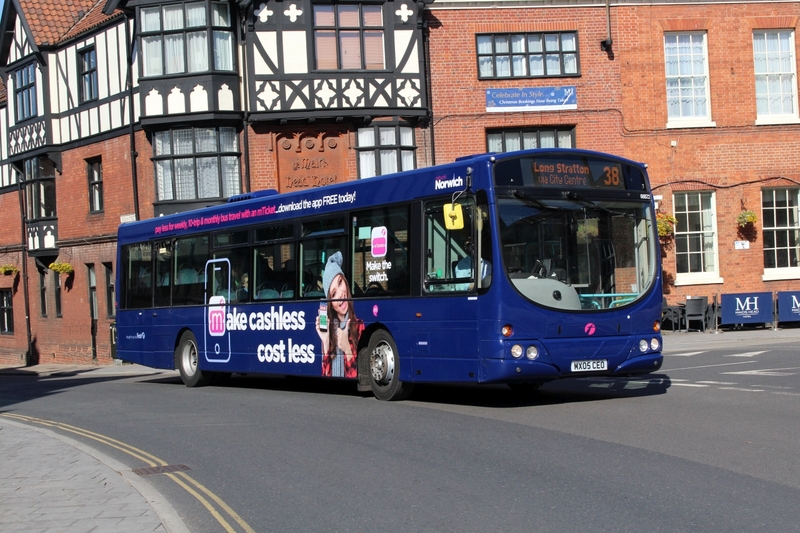 The operator has also ceased the running of its 291 between Roys' Bus Stop at Wroxham and the Market Place in Reepham from 3rd Setember 2018. Thompsons Coaches of Woodbridge has had a application granted under short notice to vary the route, timetable and stopping places of its 1FL service between the High Street in Debenham and Farlingaye High School in Woodbridge from 5th September 2018. Director Paul Frost has submitted an application, on behalf of PF Travel Limited, for a new operating centre for five vehicles at Grove Road in Woodbridge. Grahame's recent post showing the Great Yarmouth liveried Routemaster (Revisited Norwich 2007 - 2nd September 2018) prompted an email and some photos from Leon Smith. 'As a follower of your wonderful site and despite being a Glaswegian I own a caravan at Seashore on a plot which had been my parents and my grandparents before them and have been coming to Great Yarmouth since I was five years old and now at forty two years old it has become my home from home. My Dad was a bus driver since before I was born working from GGPTE through SPTE and into Strathclyde's Buses and took his share money and ran as First took over Glasgow's municipal bus operations. This upbringing together with the considerable time spent in East Anglia meant that Eastern Counties and Great Yarmouth Transport became a massive interest for me and much to my parents' chagrin I seemed to prefer spending my time at Caister Road or St. Peter's Road watching the constant coming and going of the buses to and from the depots but all the time without a decent camera. 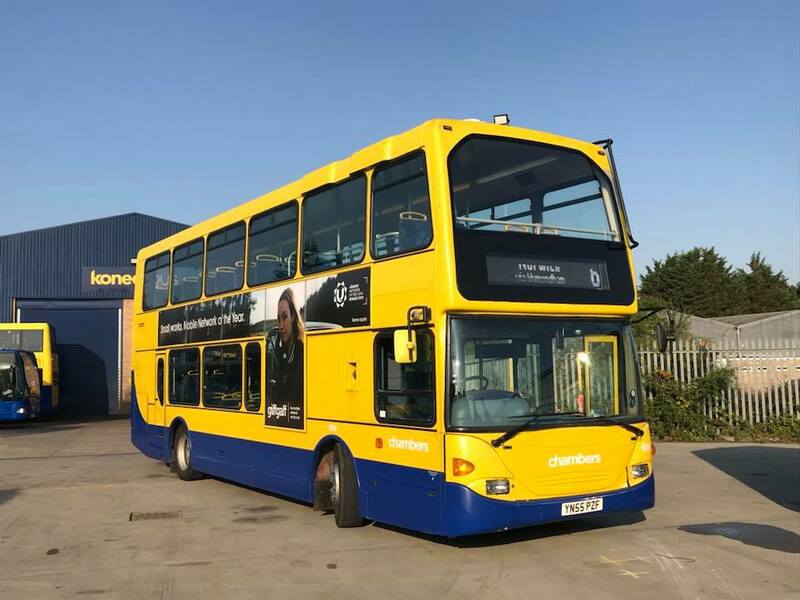 The Merseyside Dennis Dart website reveals the new owner of Dennis Javelin AW53GAU to be Eagles and Crawford of Mold in North Wales. 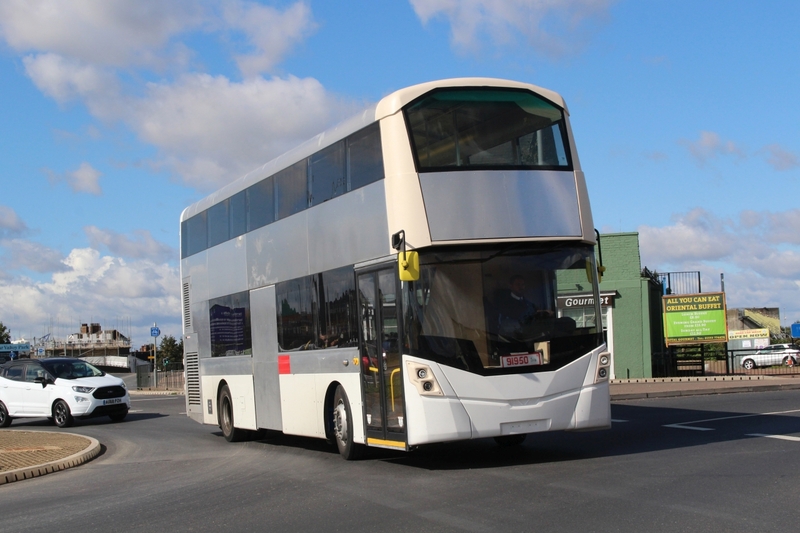 The Transbus Plaxton Profile bodied C53F coach was new to Lex Vehicle Leasing for MOD contract work in July 2014. A photo of it with its new owner, still in its Reynolds silver livery, can be viewed by clicking here. Another two of the former Reynolds fleet were noted outside Lancaster Railway Station on 18th August by Gez Nichols. He was not sure who had acquired them but both Tourismo SN57LKC and Volvo AT07GYZ were still in Reynolds livery. As correctly forecast on Thursday last (Delayed Gemini Departure-30th August 2018), 32672 SN55HEV is now with First Essex having arrived at Chelmsford earlier. Still seems hard to believe that 2007 is now eleven years ago, its always nice to look back at photos and how things have evolved over the years, this is about the time i really enjoyed days out with the camera and was always pretty much up to date with things, sadly its a bit more difficult these days but with the power of social media information is shared a lot easier! First up is former First Routemaster 39717 (RML2717) SMK717F in its much discussed version of Great Yarmouth Transport livery. It was working the Norfolk Show shuttles on this day in June 2007 and is seen here in Castle Meadow. It now resides in Thailand. 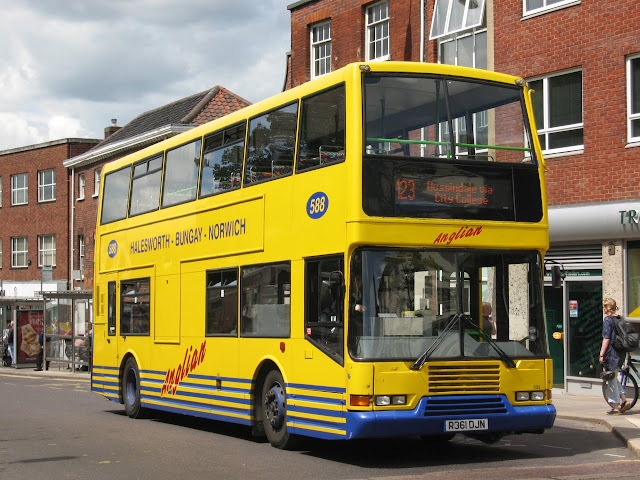 Anglian had recently purchased a batch of ex Harris Bus Volvo Olympians, R361DJN was new to them but worked under the banner of East Thames Buses until 2004, it passed to York Pullman in 2008. Sanders DAF DB250 YJ55WPA was new in 2005 and is pictured in Castle Meadow working the 43 service out of the city. As regular blog readers will know Shearings operate from Great Yarmouth and the surrounding area and we often feature them in our posts, Volvo /Plaxton Panther GT03WWW is pictured above in the combined Wallace Arnold/Shearings livery which was applied after the two major tour operators merged with Shearings buying the Leeds based company. It was originally part of the WA Grand Tourer fleet hence the GT number plate. 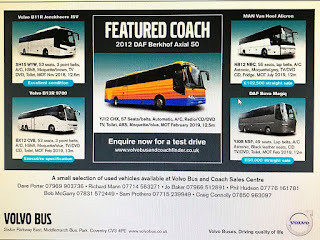 It has since passed to Deveron Coaches in Aberdeenshire. 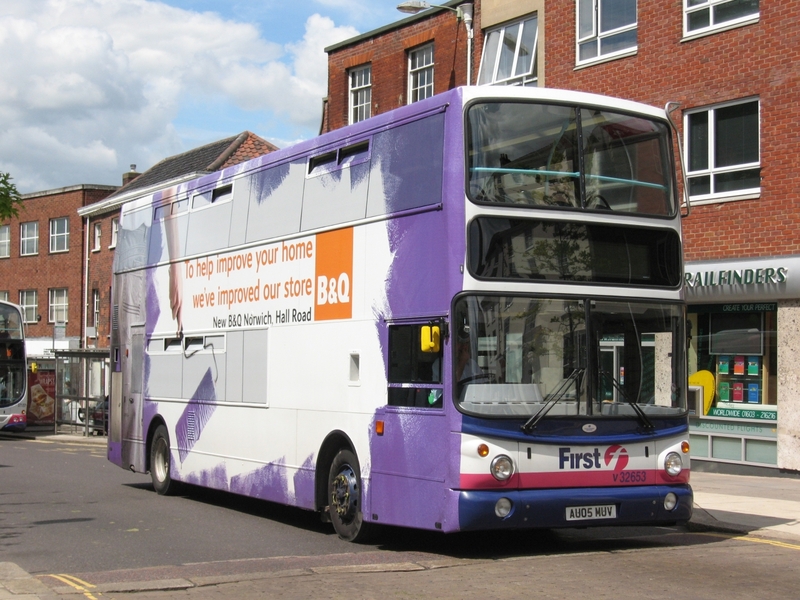 Finally we see FEC Volvo B7TL/ALX400 32653 AU05MUV wearing an allover wrap for what was the new B&Q store in Hall Road, Norwich. It also wore a wrap for Save The Children during its time in Norwich, it is now part of the Ipswich Fleet. A Variety of loan buses have been in use with Konectbus this past week with various vehicles appearing on their routes from other Go Ahead companies in the East Anglia region and beyond. 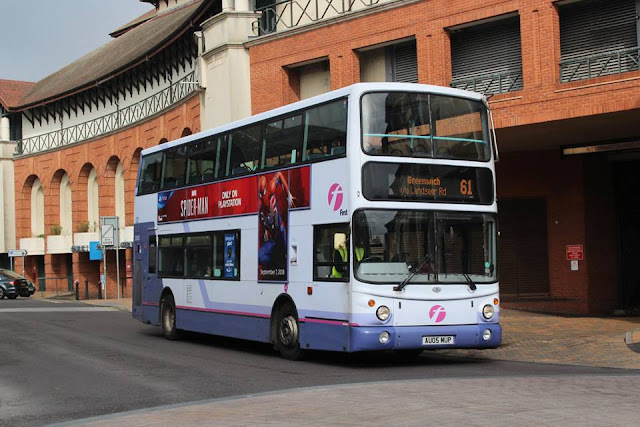 First up is former Anglianbus Scania Omnidekka YN55PZF which now operates for Chambers in Suffolk, still wearing its previous operators livery. Another Scania Omnidekka here is YN05JYE which currently operates for Hedingham although it wears Chambers livery. Another Hedingham vehicle in use is Enviro 200 (265) EU10ADX, seen here in Norwich working the 50 service. 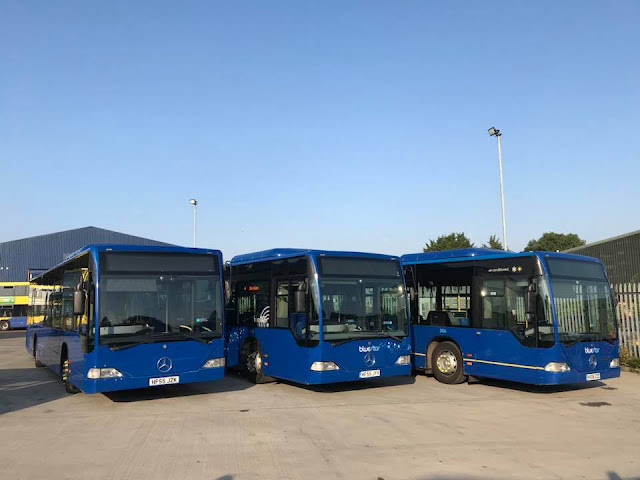 Finally three vehicles that have come from the Go Ahead South Bluestar Fleet, similar to the ones used by Anglianbus shortly before its demise. They are 2401 HF55JYX, 2410 HF55JZK and 2436 HX06EZE all Mercedes Benz Citaros. Many Thankls to Kieran Smith for the info and photos and Sam Stelling for photo also.